Every year my friend Rachel does this 30 day no shop challenge in January. The thinking is that in December we’ve all bought enough items to top off a dozen landfills and at some point we all have to look at the amount of things we’re buying and put the brakes on. Because of Rachel this year I joined a local swap shop and I pop in there every few weeks, drop off some old clothes and pick up new ones. The idea of “thrifting” makes me shudder so understand that I’m not suggesting anyone dive head first into the piles at Salvation Army (unless that makes you happy – my kooky kid likes it) but I am suggesting that we all take a look at swapping out some of the mountains of goods instead of buying new all the time. Well, this whole notion of less shopping is easier said than done particularly if you’re a mother, even more so if you’re the mother of a pre school aged child because developmental phases seem to last approximately 37.5 minutes. There are needs (both real and imagined) for new sets of toys, clothes and accessories. You buy an infant carrier and the baby hates it. At your mommy and me class you try a friend’s carrier and find out that your kid loooooovvvveeees theirs. 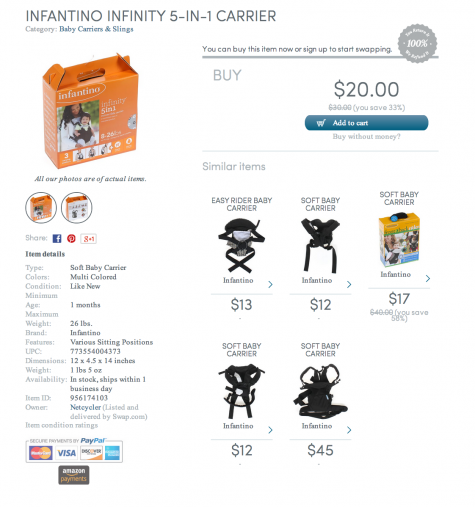 Oh hey, who doesn’t have $40 to fling into the ether for yet another baby carrier? Spending money on buying five versions of the same item is super fun, right? Pop over to Swap.com and buy a new one for cash if you like. The products are photographed and posted, you buy with a credit card, Amazon payments, or PayPal and the product is shipped to you. There’s a money back guarantee on everything and it’s all pretty straightforward. You see that little Buy without money? underneath the shopping cart logo? That’s where Swap get interesting and different from anyone else out there. You can trade on Swap.com without having to negotiate with anyone. The most difficult part of trading is taken out of the equation. You can just send in items from your house. You don’t have to photograph them, describe them, market them or anything, just price them and send them to Swap.com. If you have a printer at home (you do, don’t you?) just print out a shipping label, slap it on a box or a bag and send in your unused items anywhere from maternity clothes to teenage items. If you need a bag or a box sent from them to you it’s $3. But really? You don’t have a box or a bag? Once you’ve sent your products in they have technology they call “trade ring” and in it’s essence it’s an algorithm that creates trades with multiple people. This way you don’t have to find the one person who wants maternity dress your Aunt Sally sent you knowing that you hate dresses but she’s convinced your career will never more forward without wearing one. Your maternity dress can get swapped with someone’s Gymboree Outfit even though they wanted a baby swing from someone else. It all just sort of sifts out in a way that we can’t make happen efficiently in our personal lives. Of note: when you ship items to Swap.com they do not own them. 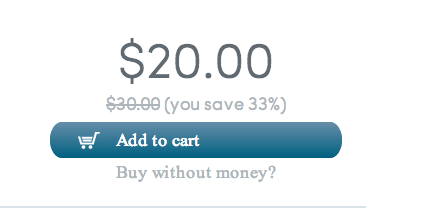 You still own the items and control the pricing. If the items don’t sell you can have them sent back to you or you can donate them to charity. It’s just like a local consignment store without the limitations of a local market. Like I said I’m recently converted to swapping in my personal life but I think that a third party like Swap.com is essential if you’re going to enjoy it. They make sure that everything is clean and in good condition with no missing parts. It’s expensive having kids and it’s fun to watch them discover a new toy and charming to put them in cute outfits. If you’re using Swap it’s a little less upsetting if they outgrow that outfit or toy before it’s used much at all, you can just buy something else with it. 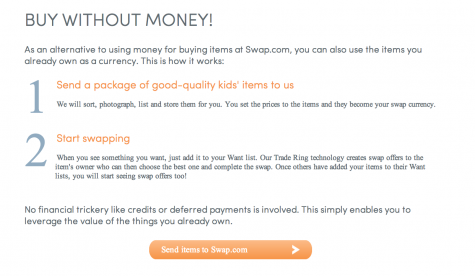 As an added incentive the folks at Swap.com wanted to give one reader $50 to try the site. Good luck! I’ll announce a winner on the 22nd. I would buy little boy clothing. I have some really fun and beautiful outfits that my daughter outgrew so quickly that they don’t even look worn. I’d send them in and check out walkers and such for my aunt and niece. I’d buy some new maternity shirts, and probably some baby girl clothing. I would buy a disney princess art set for my daughter.